The lists of some of the authors whose books were burned is interesting: Albert Einstein, Bertolt Brecht, John Dos Passos, Sigmund Freud, André Gide, Ernest Hemingway, Franz Kafka, Jack London, Karl Marx, André Malraux, Thomas Mann, Marcel Proust, H. G. Wells, B. Traven, and Erich Maria Remarque. While all of these authors are old (several where on my parents’ bookshelves), many are still read today. What was so scary to the Nazi regime that they felt the need to destroy the words and ideas of this writers? It might be interesting to read some of them with an idea to trying to understand what would have made them degenerate, decadent and indecent. In September we have Banned Books week. Maybe we should also have a Burned Books week. It made me think more about the First Amendment and Freedom of Speech. There isn’t a corresponding Freedom of Thought, but that is probably because it would be hard to enforce the negative. In this age of highly charged political conversation, we are pressed even more on the need for freedom of speech, even speech we disagree with. The German people were denied this freedom because the government wanted to control all of their lives. I hope the United States sticks to the Constitution and allows us our diversity. 1 United States Holocaust Memorial Museum. “Book Burning.” Holocaust Encyclopedia. http://www.ushmm.org/wlc/en/article.php?ModuleId=10005852 Accessed on October 19, 2016. 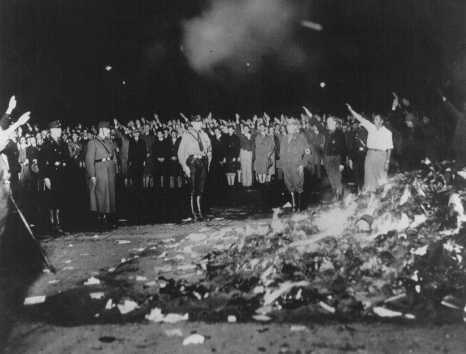 2 Books and writings deemed “un-German” are burned at the Opernplatz. Berlin, Germany, May 10, 1933. — National Archives and Records Administration, College Park, Md.